This safari in Tanzania will offer you the chance to see a wide variety of wildlife among some of the most diversified landscapes. Not only will you visit the Tarangire National Park and Lake Manyara National Park, but you will also get the chance to the Ngorongoro Crater, a UNESCO World Heritage Site. You will see huge herds of elephants, in season flocks of flamingos and troops of baboons. During the safari, you will be provided two nights of accommodation at the Ngorongoro O'ldeani Mountain Lodge. In the morning you will be picked up from your hotel, and you will travel to the Tarangire National Park. This park with its huge baobab trees, the perennial Tarangire River, and seasonal swamps is home to the largest elephant herds in northern Tanzania. Animals gather at the river and you should be able to see elephants, giraffes, bushbucks, hartebeests, dik-diks, waterbucks, warthogs, and reedbucks all year round. Furthermore, the park is also home to buffalos, zebras, and wildebeests, which are always closely followed by a range of predators such as lions. Leopards are seen every once in a while, but cheetahs are rarely spotted. From the open roof of the vehicle, you will be able to absorb the landscape and watch the animals. After an extensive game drive, you will leave the park in the late afternoon and drive to the Ngorongoro O’ldeani Mountain Lodge, where you will spend the night. Lunch and dinner is included in this day. After an early start, you will make your way to the cooler regions of the Ngorongoro Highlands. The Ngorongoro Crater is almost 600 meters deep, approximately 20 kilometers wide, and the massive caldera is home to an amazing variety of animals. On your game drive, you have the possibility of seeing all different kinds of mammals ranging from the Big Five, the lion, elephant, buffalo, rhino, and leopard, to Grant’s and Thomson’s gazelles and mountain reedbucks. You might also see spotted hyenas and some of the more than 500 bird species of the area. After a picnic lunch in the crater and some more game viewing, you will leave the crater in the afternoon and travel to Karatu, where you will stay overnight at the Ngorongoro O’ldeani Mountain Lodge. Breakfast, lunch, and dinner is included in this day. After breakfast, you will leave the highlands and continue to Lake Manyara National Park, one of the smallest but most diverse parks in Tanzania. The shallow and alkaline Lake Manyara covers a large area of the park, and it is the seasonal home to thousands of flamingos, an awesome pink sight. However, more than 500 other bird species are also found here as well as some wonderful mammals. Troops of monkeys live in the forests, giraffes, buffaloes, zebras, and wildebeests on the grassy plains and elephants and lions in the acacia woodlands. After an intensive game drive and a picnic lunch, you will leave the park to arrive in Arusha by the late afternoon. Breakfast and lunch is included on this day. 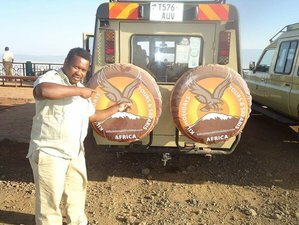 This safari will be held at the Tarangire National Park, Ngorongoro Crater, and Lake Manyara National Park in Tanzania. The Lake Manyara National Park,which encompasses an area of 335 square kilometers, of which 200 square kilometers is lake, was proclaimed a game reserve in 1957 and registered three years later as a national park. The park is situated between the 600-meter high escarpment of the Great Rift Valley and Lake Manyara and is 130 kilometers from Arusha. Thus, it can be visited on a day excursion from this center. At the southern end of the park are hot Sulphur Springs known as Majimoto. Further along the forest the area opens up into woodlands, grassland, swamps and beyond, the soda lake itself. Buffalo and hippo lurch in the adjacent Hippo Pool. The vegetation eventually merges into flat topped acacia woodland where, in the heat of the day entire prides of lion can be seen stretched on the branches of these trees, a habit prevalent to Manyara lions. Along with these amazing tree-climbing lions there are the usual browsers and grazers, as well as the curios-looking banded mongoose. Two thirds of the park is dominated by the slightly alkaline lake which is home to a huge variety of waterbirds. More than 400 species of bird including flamingo, pelican, red billed quelea, storks, sacred ibis, cormorants, and Egyptian geese can be sighted in this area. Other species of birds include the African spoonbill, lesser flamingo, white pelican, and white faced duck. Lake Manyara National Park is 130 kilometers west of Arusha and the drive takes about two and half hours. The entrance to the park is off to the left of the Great North Road at Makuyuni. From here, there is a track that goes past the lake and through the village of Mto wa Mbu to the park entrance. Mto wa Mbu (meaning Mosquito Creek) is a small busy market town selling fruit and vegetables produced by the fruitful adjacent farms. The little settlement has become a temporary stop over for tourists and campers. The Ngorongoro Conservation Area (NCA) covers some 8,300 square kilometers. It boasts the finest blend of landscapes, wildlife, people, and archaeological sites in Africa. It is also a pioneering experiment in multiple land use. The concept of multiple land use in conservation perspective is a deviation from a traditional approach of regarding conservation as complete absenteeism of human interference. Rifts and volcanoes shape the landscape of Ngorongoro. A rift is a disturbance in the earth crust, which causes rise or falls of its borders. Rifts also causes lava or melted rock to penetrate to the surface where it hardens. If lava emerges from the same penetration for a long period, it builds up into a volcano. In the Ngorongoro Conservation Area, the main rifts are north of Lake Eyasi and east of Lakes Manyara and Lake Natron, where the nine volcanoes of Ngorongoro highlands were formed during the past four million years. Of these, only volcano Oldonyo Lengai is still active. The ash and dust from the eruptions was carried by the wind to form the fertile soils of the Serengeti plains. Today, Ngorongoro’s caldera shelters the most beautiful wildlife haven on earth. The rich pasture and permanent water of the Crater floor supports a resident population of some 20,000 to 25,000 large mammals. They are not confined by the Crater walls, and can leave freely; they stay because conditions are favorable. Since most of the Crater floor is grassland, grazing animals predominate: gnu, zebra, gazelles, buffalo, eland and kongoni (Coke’s hartebeest) and warthogs. The swamp and forest provide additional resources for hippos, some of Tanzania’s last remaining black rhinos, giant-tusked elephants, waterbucks, reedbucks and bushbucks, baboons and vervets. The steep inner slopes provide a habitat for dikdiks and the rare mountain reedbuck. Towering euphorbias cling to the crater walls and on the floor, Fever tree and Fig tree forests give shade to an awe-inspiring array of creatures. All these animals in turn support large predators such as Lion and Leopard, and scavengers such as Hyena and Jackals. For the best viewing and photography, approach the animals slowly and quietly and stay on the official tracks. What you can see of birdlife depends greatly on the season of the year, because there are resident birds and migrant birds. You are certain to see many residents, like ostriches, bustards and plovers all year round. In wet season they share the Crater with European migrants such as White Storks, Yellow Wagtails, swallows, and many more. The migrants pass through from November through May, coinciding with the rains in Africa and the winter in Eurasia. There are also local migrants such as flamingos, storks and ducks which come and go depending on the state of the lake and ponds. Other birds you can see are Stonechat, Anteater Chat, Schalow’s Wheatear, Fiscal Shrike. Augur Buzzards, Verreaux’s Eagle and other raptors live in the Crater. Ngorongoro safari lodges are situated on the rim of the crater, which is 2,235 metres (7,264 feet) above sea level. It can get quite fresh up here, and gets very cold at night in the winter months of June to August, but is opposingly hot down in the crater during the day. The weather is usually dry from June to November. July is the coldest month and highland temperatures may fall below freezing. It rains anytime from November to May, with the longer rains in April to May. The amount and pattern of rainfall varies and a dry period in January and February may split the rainy season into short and long rains. The forested eastern slopes get much more rain due to their elevation than the arid country to the west. The rain arrives in stormy showers usually during afternoons and nights, which cleanses the air to reveal clear views. Interpretive game drives through the emerald plains and forests of the crater floor engender guests with a respect for the people and wildlife of this world wonder. A sheer dirt road descends from Malanja Depression on the crater rim to the crater floor. At the top of the road, Maasai women and children allow you to photograph them for a small fee. The Malanja depression is grassy and open and is a good place to spot typical highland antelope such as mountain reedbuck and Kirks dik-dik, and birds such as the striking auger buzzard and Schalows wheatear. The dominant feature of the crater floor is Lake Magadi, a shallow soda lake that supports large flocks of flamingo. Much of the crater floor is open grassland, making animal spotting relatively easy: black rhino, lion, hyena, gazelle, wildebeest and zebra are all commonly seen. The hippo pool near Mandusi Swamp is a popular picnic spot. It is 120 kilometers from Arusha, bordered with Tarangire Wildlife conservation area to the northeast, an area set apart by the government, to cater for the needs of the local people as a grazing ground for their herds. The park owes its name to Tarangire River, which flows across the area. It is characterized by dense vegetation of acacia and mixed woodland, the area around Tarangire River, however, is dominated by huge baobab trees and old doum palm trees to a lesser prominence, as well as black cotton grass. Though it is not as famous as other parks in the north, Tarangire offers the same attractions as other parks in the north. Its unique aspect is the annual animal immigration that takes place during the dry season. While Serengeti’s animal migration has attained mundane fame, for many tourists, little is known of Tarangire annual migration. The difference with Serengeti, however, is that, in Serengeti, animals migrate away from the park during the dry season (June to October), the opposite happens in Tarangire; animals migrate from Maasai Steppe to the park during the dry season. They migrate to the park in search for water, which is provided by Tarangire River, and predators migrate along in search for preys. During this period the park has the largest concentration of animals than in any park in the northern Tanzania. June to October is the best time to see large number of wildebeest, elephants, zebras, and hartebeest. Not all animals are migratory though, other animals such as giraffes, Impala, Eland, lesser kudu, waterbuck, gazelle, and sometimes rhinos or leopards can be seen throughout the year. More people are attracted by the giant pythons and large herds of elephants. the park is also famous for migrant birds. You will be served daily breakfast, lunch, and dinner. All kinds of food can also be catered. To avoid health problems, use only bottled or filtered water for drinking and brushing your teeth. Bottled water is cheap and readily available in Tanzania, and all lodges and restaurants will have it available. Please book your flight to arrive at Kilimanjaro International Airport (JRO). Transfer from and to the airport is included. Kiliholidays Tours & Safaris will pick you up from the airport.